The History of the Hampton Beach Includes Fact and Legend – You’re Bound to Find History Here! Hampton has struggled to preserve its history and in recent years, done so successfully. 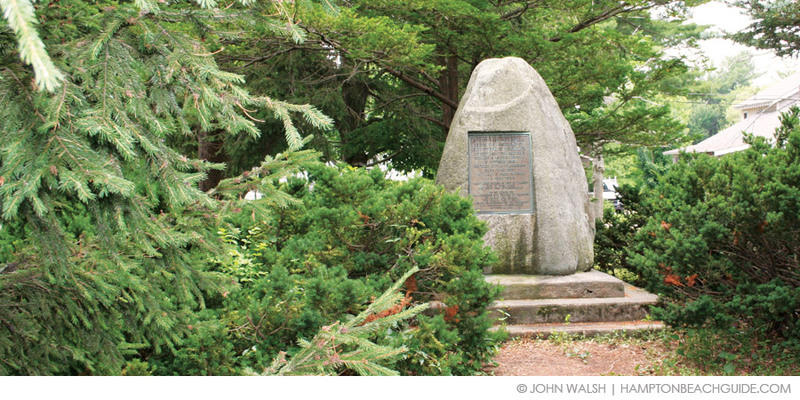 Plymouth, MA, may have its one famous “rock,” but did you know that Hampton has two? The largest historic attraction in Hampton is the multi-building Tuck Museum, which is home of the Hampton Historical Society. The Tuck Complex is composed of four buildings, various monuments and numerous artifacts. Located on Park Ave. across from Meeting House Green/Founders Park, the museum is home for numerous collections and exhibits, including paintings by artist Charles Henry Turner, various other paintings, assorted statues and photographs and numerous historic postcards relating to the changing culture of Hampton. Of special note is an exhibit dedicated to Eunice “Goody” Cole, who was tried for witchcraft and found guilty in 1656 and another exhibit on education in the 18th century, which is housed inside an authentic one-room schoolhouse from 1750. Two historic markers of note in Hampton are the one regarding The Landing and Landing Road and another related to Bound Rock. The Landing is where the Reverend Stephen Bachiler and his flock stopped after having traveled up the Hampton River. It was there on October 14, 1638 that they established Landing Road and the first settlement in Hampton. Bound Rock, a barn-sized boulder, is one of the oldest boundary markers in the United States. The rock was first used in 1659 to demarcate the line between Salisbury and Hampton. It sat in the middle of the Hampton River. Eventually it became the line between Seabrook and Hampton. Although originally in a river channel, over the years the river changed its course and Bound Rock became a center of controversy. Once on dry land, Seabrook claimed the center of the new river channel and not Bound Rock marked the border. Eventually, Hampton won the case and kept the land. Bound Rock is now a National Historic Site and it was enclosed. It will remain out of the water due to protective jetties and dredging of the river. The second rock of note in Hampton is Norseman’s Rock, which was first located off Thorvald Ave. but has been moved to Meeting House Green on Park Ave across from the Tuck Museum. The rock is thought to have marked the grave of Leif Erickson’s brother, Thorvald, who was killed in 1008 A.D. by Native Americans. Both Viking mythology and Native American lore support this belief and there are markings on the rock that are considered to be of Viking origin. Rock on when you check out the history of Hampton and then that night enjoy some rock at the Casino Ballroom or at one of the local restaurants or pubs.